The Clean Development Mechanism must be amended. What shape should it take? The Clean Development Mechanism (cdm) is up for review and there are several proposals to reform the process. The mechanism has always been under severe criticism, since its inception, on various accounts, ranging from its philosophical principles to its administration. The mechanism was created to help the developing nations to access finance required to implement projects that would reduce emissions below a certain defined level. On the other hand, the same process is also expected to help developed nations to reach their emission reduction targets by paying for emissions avoided in the developing nations. But, over a period, the practice has turned out to be a process that has hardly helped avoid emission in the developing countries; moreover, it has provided emissions credits to the rich countries at a cheap rate. From its inception, the operations to promote 'clean' development through cdm has remained questionable. The most controversial operative in the game remains the Designated Operational Entity (doe), or consultants accredited to the cdm Executive Board. These consultants are paid by project proponents even as they work for the board to validate a proposed project. This conflict of interest makes cdm an opaque process. It is no wonder these consultants figure pretty high in the reform agenda. It is obvious in the climate negotiation parties acknowledge this faulty system and so are looking for changes. Suggestions range from ensuring quality work 'through, for example, the accreditation process and frequent, in-depth spot checks of their work', to eliminating them by employing trained staff within the secretariat to validate the projects. Stories abound on how these consultants lie in proposals to make projects look fit for certified emission reductions (cers). The deception has resulted in approval of projects that hardly avoid unclean processes, are unsustainable in nature and get falsely tagged with additionality. Consideration of paying these consultants directly by the cdm board has also been suggested in the reform agenda. There is also a hint of changing the composition of the Executive Board by creating better representation of various parties involved in negotiations. The mechanism is predicated on a list of activities for which credits are accepted. There is a growing demand to enlarge the list to include methodologies that can help avoid emission. Some of them are new technologies like Carbon Capture and Storage, that came much after the list was drawn up in 2001. But there are others, like the demand to include nuclear power in the cdm stable, that are seen to be just an easier way to earn credit for the developed world, which has failed to reach anywhere near its reduction targets. One of the important proposals on the table, in terms of broadening the list of activities acceptable under cdm, is to introduce a sectoral approach in emissions reduction. The current mechanism allows only a programme of activities to be registered for generating cers. More activities may be added to the programme if they meet the original methodology and criteria for approving the project. The new proposal will allow processing of cdm activities to be sector wide. If allowed, under the new cdm regime, the Indian cement industry as a sector can consider a project, including development, registration and ongoing verification, as an aggregate sectoral entity. There are variations in approaches by different parties on this proposal. But, whatever the approaches, sectoral cdm activities will generate a high volume of cers and will lower the cost of administration and technical assessment. On the other hand, there is also a fear that these projects will probably lower the price of cers, by increasing its supply, without steps being taken for deeper cuts in the industrialised world. Similarly, an inclusion of new nuclear power stations as cdm activity will pump up the supply of cers significantly. Like the sectoral approach, this too will decrease the price of cers. Both these approaches will reduce the burden of domestic mitigation on the part of rich countries as they will have access to large volume of cers at a lower rate. In practical terms, this boils down to global mitigation being shouldered by developing countries at a cheap rate. In the case of nuclear power being a cdm activity, the incentive to develop renewable options will minimise, say critics. Clean development mechanism was meant to tackle climate change. A study by Centre for Science and Environment, New Delhi, found not only was this mechanism unclean, it was also corrupt. Most of the money was going into dirty projects and the North was paying a pittance for them. The cheapest projects turned out to be the dirtiest with very little actual reduction. International auditing firms were found indulging in fraud by simply copying and pasting project design documents, vital for getting projects cleared. Local communities had no say and gained nothing out of these "private" deals. A sudden surge by developed countries to break down the developing nations as one entity has also left some marks in certain cdm proposals. Currently, according to the spirit of the unfccc, any non Annex i country could host a clean project and sell cers to an Annex i country. A new idea has been mooted to approve projects based on a country's development index. It must be noted that, in recent months, developed nations have been arguing that there are various stages of development among the developing nations and, thus, they should not be treated as one. There are speculations to use either a country's gdp or ghg emission per capita to decide the nature of projects a country can derive cers from. It will be difficult to get this idea ratified as developing countries, specially stronger economies within the bloc, are expected to oppose it tooth and nail. There are also other worries of incorporating the dynamic nature of the prescribed indices into the mechanism. It will be difficult to decide continuation of a project if a host country's gdp or ghg emissions per capita goes up during the project period. cdm has always been criticised as it does not push the rich countries to take a deep cut in their emission, badly needed to stay within a 2C rise in global temperature. On the other hand, it is not surprising developing countries like India and China have maintained a near-monopoly in the cdm market with projects that do not reduce emissions substantially. A market-driven corrupt practice has also taken toll on the nature of the projects that get validated. Most of the projects selling cers are not necessarily environmentally sound practices. The largest cdm reduction has taken place for hfcs, and that can be linked to the market. The biggest business possible in the cdm market remains avoiding hfc-23, a gas almost 12,000 times more potent than co2 to cause global warming, as this can earn higher number of cers. It is argued the refrigerant industry can earn almost double from cers through destroying hfc-23 than what they earn from selling refrigerant. A cdm possibility actually signals the producers to produce more refrigerant. The condition of additionality is the biggest hit in such a market operation. 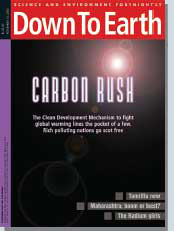 Michael Wara and David Victor of Stanford University, in their publication "A Realistic Policy on International Carbon Offsets", clearly show all Chinese new hydroelectric, wind and natural gas-fired plants have applied for cdm, arguing they could not achieve these projects without additional funds. Wara and Victor find it impossible to believe China was not in a position to generate any hydro, wind and natural gas-fired power at all without credit money coming in. Easy and corrupt practices within cdm lead developing countries to have relaxed efficiency norms of energy use, as it helps them to show avoidance in a cdm project. It would have been more effective if the mechanism had helped developing countries go for ambitious norms and then get help from credit money to implement those projects, such as public transport and rural electrification through renewables, that will allow these countries achieve higher efficiency and sustainability. The biggest barrier to reinventing the world's energy system is the price of the low-carbon technologies. The Intergovernmental Panel on Climate Change's fourth assessment report has concluded that a carbon tax (or price) of us $50-100 on a tonne of co2 equivalent is needed to make deep cuts in emissions in the world. It is for this reason that a new-look cdm must include a minimum floor price, which will ensure only high end or transition technologies will get into the system. To begin with, the entry level price could be pegged at us $30-50 to provide the incentives for structural change. Currently, only eu and Japan are large buyers of cers. A few more countries will be joining in future. But the biggest demand for credit will come from the us if they join the market. This high demand may increase the price of carbon in the future. 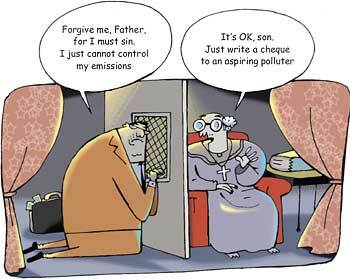 But till then, carbon price, like most other goods and services in a market condition, simply externalises the real cost of climate change. Most tellingly, a lower price of carbon will never make the options of renewables attractive.